As mentioned on Dreadnaught here, here, here, here, and here, Charlie Weis must be fired. Charlie lost today to UConn. Yes, he lost to Navy and UConn in the same year. Charlie, what happened to the the “decided schematic advantage“? Wait, maybe you were misquoted. You intended to say that with you as head coach, Notre Dame would have a “decided schematic disadvantage.” That is what they have. Take your cash, your FUPA, your barely-.500 winning percentage, and your condescending attitude and go back to Jersey. You are a joke! 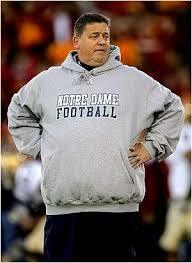 Charlie Weis is on his way out at Notre Dame. Loss last week to Navy. Now a loss to Pitt. As has been called on here, here, here, and here, Notre Dame must replace Charlie Weis. Charlie Weis made history in 2007 by losing to Navy for the first time in 44 years. He did it again today by losing to Navy 23 – 21. This takes Notre Dame out of the BCS, with their third loss of the season. This should increase the calls for Charlie Weis to be fired. As mentioned here, here, and, here, Notre Dame needs a new coach. Another note on the game, specifically on the coverage by NBC, the praise for Jimmy Clausen is getting worse every game. Praising Clausen for his ability to make comeback wins in the 4th quarter is more of an indictment of Notre Dame. They are losing for most of the quarters they play. That is not a good thing. The Trojans get another victory over Notre Dame with a final score of 34-27. The standout player for USC was tight end Anthony McCoy, with 5 receptions for 153 yards. If you want to know what is wrong with Charlie Weis, one need only to listen to the comments he made coming off the field. We ran a combination route where Golden got doubled, which we thought he would, over on the right-hand side. He did, over on the right-hand side. We were going to to to a high-low or to the left and when Duval came out of the break he slipped coming out of the break. He was open, but he slipped, slipped, slipped coming out of the route. I am a great coach. I made the correct call. I had an unbeatable scheme. It was all Duval Kamara’s fault. Pathetic. Be a head coach. Take responsibility, don’t blame a player. 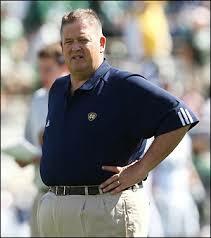 Notre Dame deserves a better coach than Charlie Weis. Note Dame coach, Charlie “I Looked at Myself and Saw a Disaster” Weis clamed the 2009 loss to USC was a moral victory. Irish fans have to understand that Weis can not turn this team around in just five seasons, despite the fact that his team will, in “every game . . . have a decided schematic advantage.” You must understand, he is suffering from the poor recruiting done by Ty Willingham. Again, you can not expect Weis to turn the program around in just five seasons. It has taken a number of head coaches to get their teams to national championships. Nick Saban did it in his 4th season, Pete Carroll did it in his 3rd season, Bob Stoops did it in his 2nd season, and Urban Meyer did it in his 2nd season. Well, those are all less than the five seasons Weis has had, but it is different for Weis. Not sure how it is different, but it is. It can not be Charlie Weis’s fault, he is just too great of a coach. Remember Charlie Weis making history last season by losing to Navy for the first time in 44 years. That was also Willingham’s fault. Don’t blame Weis. SOUTH BEND, Ind. (AP)—Notre Dame coach Charlie Weis gathered his players after the final practice before the 25th-ranked Fighting Irish face No. 6 USC on Saturday and made a prediction. The storyline he’d probably like to see most is Jimmy Clausen having the game of his life to beat the Trojans, ending a record seven-game losing streak by the Irish to USC to become a leading Heisman Trophy candidate. The one he’d like to see least? Another USC blowout, putting his job in jeopardy. Dreadnaught prediction: USC by 10.